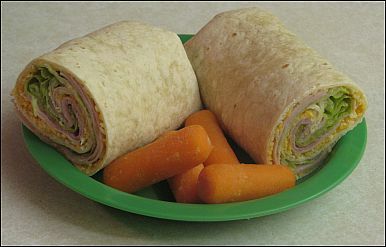 The lunch recipes on this page help make teaching kids to eat healthy just a little bit easier. Start a good habit now that will last a life time. Pick a recipe from these kids lunch recipes and add a fruit and a vegetable for an easy-to-eat kid meal! There is nothing more influential in getting a child to eat their lunch than to let them make it themselves. Place all items on the table and let the kids build their own sandwiches. A favorite in my daycare. Regular tacos are hard for small children because they fall apart. This makes eating a taco easier. Spread butter or Miracle Whip on the flour tortilla. Put on a layer of deli turkey and then a layer of deli ham. Sprinkle with shredded cheese and top with some lettuce leaves. Fold the sides in about a 1/2 inch to prevent ingredients from falling out while the kids are eating. Then roll the tortilla up tight. Cut in half and serve. Measure water into a large pot and add bouillon. Boil chicken until fully cooked. Remove chicken from the broth and cut into small pieces. Add the noodles, carrots, basil, oregano, salt and pepper. Bring back to a boil, then reduce heat and simmer 20 minutes before serving. Butter the bread. Place bread on a griddle over medium heat; butter side down. Place cheese on the bread. Monitor the bread and remove from griddle when golden brown. Put all ingredients in a large pot except for the water. Once all is warmed through, slowly add water until soup has the consistency and flavor you desire. Simmer for 30 minutes. Place soup in a blender and blend until smooth. Serve immediately. The kids in my daycare are my taste testers when I’m trying new recipes. And to tell you the truth, while I was preparing these chicken fingers, I was betting nobody would eat them. Boy, was I wrong. Even the little girls who normally don’t eat a lot of protein were asking for seconds! Preheat the oven to 400° F. Spray a baking sheet with nonstick cooking spray. 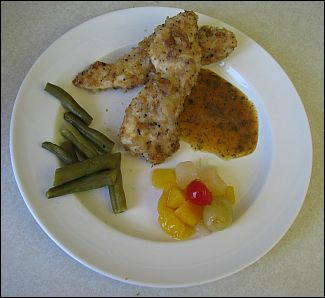 Cut the chicken breasts into lengthwise “fingers”, 4 – 5 per breast. Place in a bowl. Add the vegetable oil and stir to coat evenly. In another bowl, stir together the bread crumbs, Parmesan cheese, oregano, salt and pepper. Transfer to a plastic bag. Add the chicken strips a few at a time and shake to coat with the crumb mixture. Arrange on the baking sheet. Bake for 15 minutes, turn the strips over and continue to bake for another 10 minutes or until nicely browned and cooked through. While the chicken is cooking, make the dipping sauce by combining all ingredients and mixing well. I don’t know what it is about this recipe, but I constantly have parents ask how I get kids to eat sloppy joes when they won’t eat them at home. I like making the batch big and then freeze half. 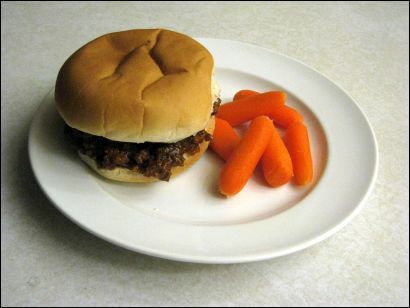 The next time I need sloppy joes, there’s no cooking! Chop the onions so small the children will not see them. Brown the ground beef with the onions. Add the remaining ingredients and simmer until you get the desired consistency. 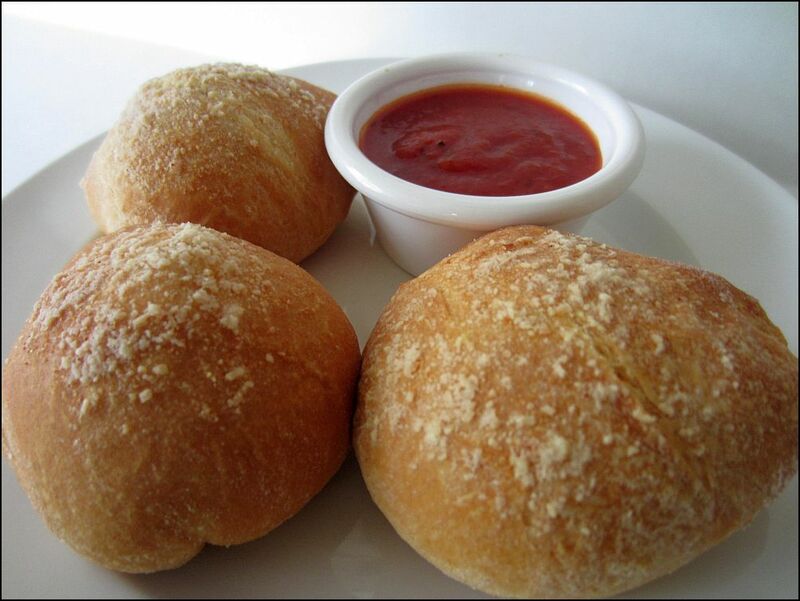 Serve on buns. Fill a large pot half full of water and bring to a boil. Add macaroni and reduce heat to medium. Cook the macaroni for eight minutes. Drain and rinse with cold water. Transfer to a large bowl. Add miracle whip, cheese, ham and pepper and mix well. Mix in the peas last so that you don’t smash them all. Best when chilled overnight, but a minimum of 2 – 3 hours. I don’t have time during daycare to make a homemade pizza crust and homemade sauce, so this version of homemade pizza is the cheaters version! Preheat oven to 400 degrees. Spray a jelly roll pan with cooking spray. Spread refrigerated pizza crust over the pan. If edges get too thick, cut off and dispose. Bake in oven for 5 minutes. Remove from oven and evenly spread pizza sauce over the crust. 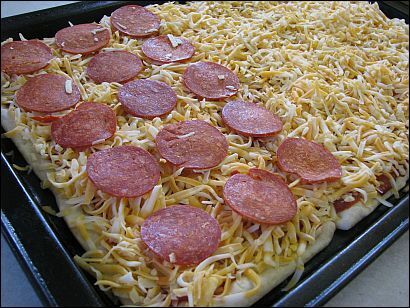 Sprinkle both cheeses evenly over the pizza. You can stop here for cheese pizza or add your own meat. Pepperoni I buy pre-sliced in the deli section of the grocery store. For sausage pizza, I buy a pound of ground sausage and cook it up. After adding your additional toppings, return to the oven and bake for another 12 – 15 minutes. This is a great recipe for those hot summer days when you don’t want to turn the oven on. Alternate loading the ham, cheese and pineapple chunks onto the Popsicle sticks. 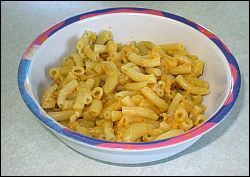 I’ve tried a lot of homemade macaroni and cheese recipes so that I could appease the food program requirements, but I was giving the kids something they would eat. They were all so used to the boxed macaroni and cheeses that they would not eat anything else. I finally came up with this recipe and they like it! 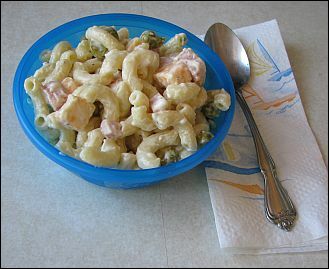 In a large pan, boil the two cups of elbow macaroni along with the pasta from the boxed mix for 7 minutes. Drain. Melt the butter in the pan from the macaroni. Put the macaroni back in the pan. Add milk, shredded cheese, salt and powdered cheese from boxed mix. Mix well. 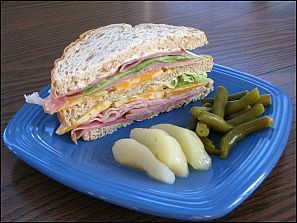 If you need to add more protein to the meal, you can either cut up hot dogs to put in the macaroni and cheese or serve a small deli meat sandwich on the side. I like finding meals that my daycare kids love and then are loved by my family later. This is definitely one of those recipes. In a large skillet, combine the first six ingredients. Cook, uncovered, over medium heat for ten minutes. Brush melted butter on one side of a tortilla. Place the tortilla, buttered side down, on a baking sheet. Spread 2/3 cup chicken mixture over the tortilla. Sprinkle generously with shredded cheese. Top with a second tortilla, buttered side up. Bake in a 375 degree oven for 8 minutes. Flip the quesadilla over and bake an additional 3 minutes. Remove from oven. Let cool for a few minutes and then cut into triangular wedges. Serve with sour cream and guacamole, if desired. Brush melted butter on one side of tortilla. Place the tortilla, buttered side down, on a baking sheet. Sprinkle generously with whatever cheese blend you like. Top with a second tortilla, buttered side up. Bake at 375 degrees for 8 minutes. Flip over and bake an additional 3 minutes. The kids were nervous when they saw me making homemade fish sticks. They wanted to make sure they would taste as good as the frozen kind they were used to. This was my first attempt at homemade and they loved them! Cut the fish fillets into “sticks” and set aside. In a shallow bowl, combine the finely crushed bread crumbs, corn flakes, Parmesan cheese and pepper. Mix well. Make an egg wash by beating the two eggs and milk all together. Place in a shallow bowl. 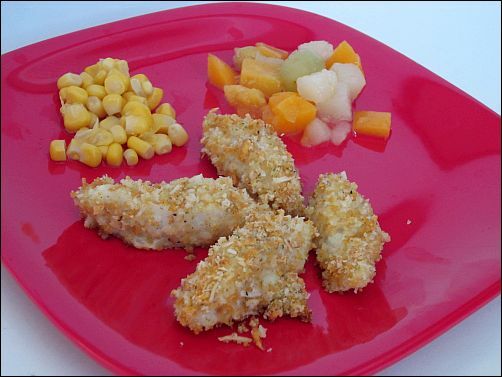 Drop a few fish sticks at a time into the egg wash, then place them into the crumb mixture and coat with crumbs. Place on the baking sheet. Bake for 15 to 20 minutes until lightly browned. 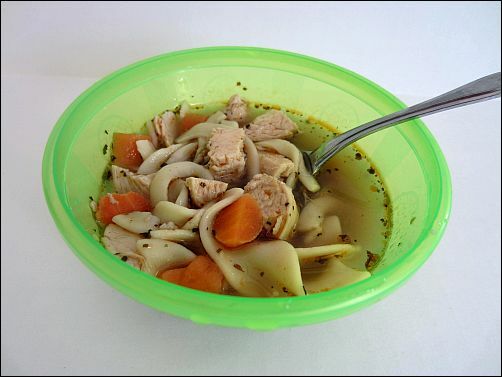 Combine chicken, celery, Miracle Whip, onions and mustard in a bowl and mix well. Chill for at least one hour. Spoon chicken mixture into a croissant and serve. 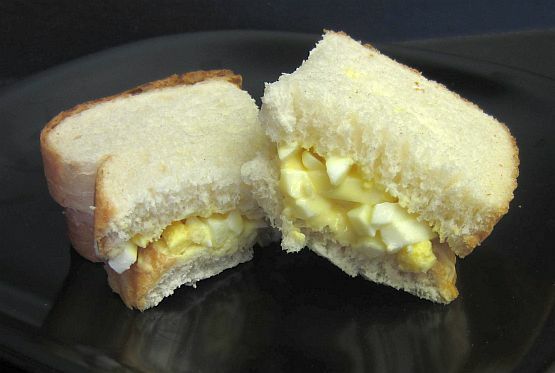 When I first starting serving egg salad to the kids, they were quite hesitant. So I told them it was made from alligator eggs and that I had to go across the street to the swamp to wrestle the gators in the morning before they got there. They could also be dinosaur eggs, if you have a better story for that! Add the Miracle Whip, celery, onion, mustard, salt and pepper and mix well. Spoon a small amount of egg mixture onto a slice of bread. 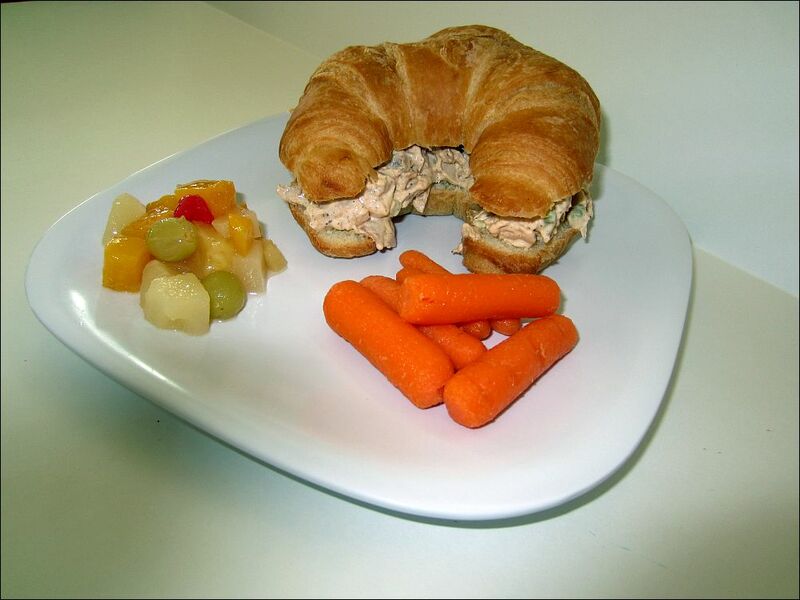 Top with a second slice of bread and cut into quarters to make kid-size servings. I had a little girl in my daycare tell me over and over how much she like ravioli. Of course, I wasn’t allowed to serve her the canned ravioli that her parents gave her so I had to come up with a recipe. Happy to say, this was a success! Ravioli: In a large pan, cook ravioli according to package directions. Add the ground beef and spaghetti sauce and heat through. 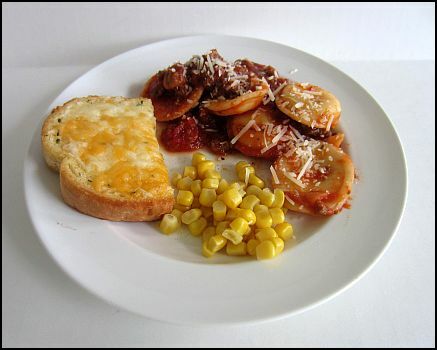 Serve on a plate and top with Parmesan cheese. I spent so much money on different types of store-bought garlic bread trying to find one the kids would eat. I finally decided to come up with a recipe of my own. For every two slices of bread, you will use 2 tablespoons of butter and 1/4 teaspoon garlic powder. Cut the crust off each slice of bread. Melt the butter. Add the garlic powder and mix well. Brush onto both sides of bread slices. It’s optional to top the bread with cheddar or mozzarella cheese. Bake in a 375 degree oven for 5 minutes. Flip the bread and bake for another 3 minutes. Spread about a teaspoon full of barbecue sauce on each deli round. 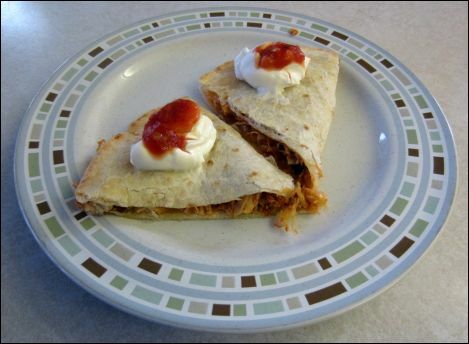 Top with shredded chicken and then shredded cheese. Bake in a 350 degree oven for 8 minutes. Preheat oven to 375 degrees. Spray a 9″ round baking pan with cooking spray. Separate each biscuit into two layers. Cut each meatball in half. Cut each string cheese stick into 8 pieces. Place 1/2 of a meatball and a mozzarella cheese piece on each biscuit. Wrap dough around it and seal by pinching edges. Place seal side down on baking pan. Sprinkle with Italian seasoning, garlic powder and Parmesan cheese. Bake for 18 – 20 minutes until golden brown. 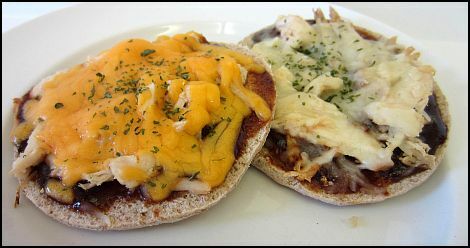 Mix shredded chicken with your choice of BBQ sauce or pizza sauce. Separate the crescent roll dough into individual triangles. Roll them out slightly larger than how they come out of the can. Place 1-1/2 ounces of shredded chicken in the center of each roll. Add 1/4 ounce of shredded mozzarella. 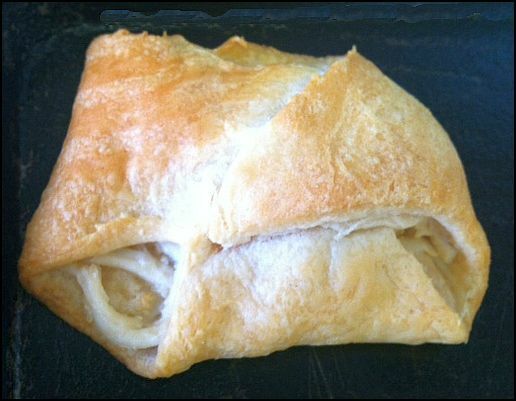 Pull the three corners of the crescent roll to the center and pinch to seal. Place on a baking sheet. Bake for 10 – 12 minutes until golden brown. Serve immediately. In a medium sauce pan, bring 4 cups of water and 1/2 teaspoon of salt to a boil. Reduce to medium heat. Add pasta and cook for six minutes. Drain well. In a separate sauce pan, stir together chicken broth, 1/2 cup water, tomato paste, tomato sauce, dried onion, garlic salt, Stevia, butter and Parmesan cheese. Bring mixture to a boil, lower the heat and simmer until the butter melts completely. Pour the pasta into the sauce and stir to combine. I have two different methods to add ground beef to the recipe. One is to season up the beef and press into an 8″ x 8″ baking pan. Cook it in the oven at 350 degrees until it’s cooked through. Let cook a bit and then cut into small squares to add to the spaghettios. Method number two is to use frozen meatballs. Thaw the meatballs and then cut into quarters to add to the spaghettios. In a medium bowl, combine soup and milk. Mix well. Add the diced chicken and mixed vegetables. Mix well again. Spray 10 cups of a 12 cup muffin tin. Roll each biscuit into a 4″ round. Place one biscuit into each muffin section and press to fit bottom and up the side. Spoon 1/3 cup chicken mixture into each. 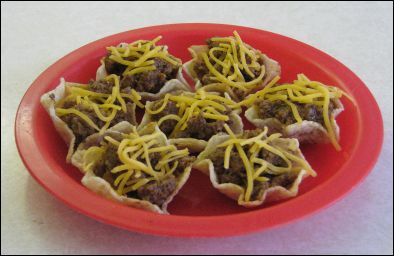 Top with a generous pinch of shredded cheese on each cup. Bake for 20 – 22 minutes. Cool for a few minutes before serving. Combine the first nine ingredients together and mix well. Divide into 4 ounce portions and form into balls. Flatten with a glass and indent the middle slightly for even cooking. Fry on the stovetop until each side browns nicely and there is no longer pink in the center. 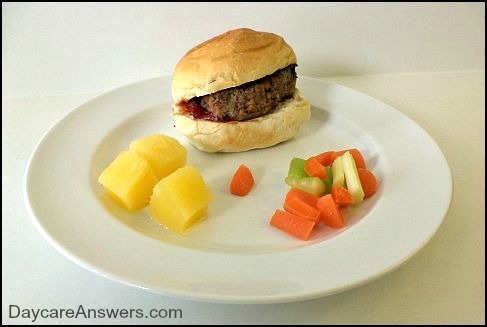 For cheeseburgers, place a slice of cheese on the burger for the last minute of cooking. Serve burgers on the dollar buns with ketchup and mustard. These fillets are made up ahead of time and placed in the freezer for a minimum of an hour. This preparation allows the breading to adhere to the fish, the result being a crispy breading on the outside and tender fish filet on the inside. Mouthwatering! Prepare fish filets by lightly salting them on both sides, trimming off the thin edges and cutting into squares that are sandwich sized. You need to prepare three bowls for dipping. The first bowl is the crushed corn flakes. The second bowl is the mixture of the flour, salt and pepper. The third bowl is the eggs and milk, beaten well. Prepare a baking sheet to put the fish on and place in the freezer by lining it with waxed paper. Coat the filets by dipping into the flour mixture, then dipping into the egg mixture, then dip into the cornflakes, then a second time in the egg mixture and a final coat of cornflakes. Place on the prepared baking sheet and put in the freezer for an hour. After an hour, you can either cook the fish for immediate use or you can place in freezer bags to store for up to one month. When ready to cook the fish, fill the bottom of a large frying pan with about 1/4″ of vegetable oil. Preheat the oil. Place filets in the heated oil and cook on each side until golden brown. Internal temperature should be 135 – 140 degrees. Filets can be cooked from the frozen state. Open up the hamburger buns. Spread tartar sauce on the top and place an American Cheese single on the bottom. Place cooked fish filet on the bun and serve. I serve each kid a 1/2 sandwich to start with.